Let’s imagine we are going to paint a bird. First of all the paper – my favourites are Langton Prestige 300 GSM watercolour paper and Bockingford 425 GSM. However, most of my work is done on the Langton 300 GSM, this paper holds the quantity of water which I use. Most of my work is done in Inks and Watercolour pencils. The inks I use are Winsor and Newton and the pencils are by Derwent, but these are my preferences and other brands will, no doubt, work equally as well. We will start with an A4 size piece of paper; I use a medium to soft charcoal pencil for the initial outline which is drawn onto dry paper. Once you have sketched the outline of the bird (only the outline) the next stage is to apply colour. 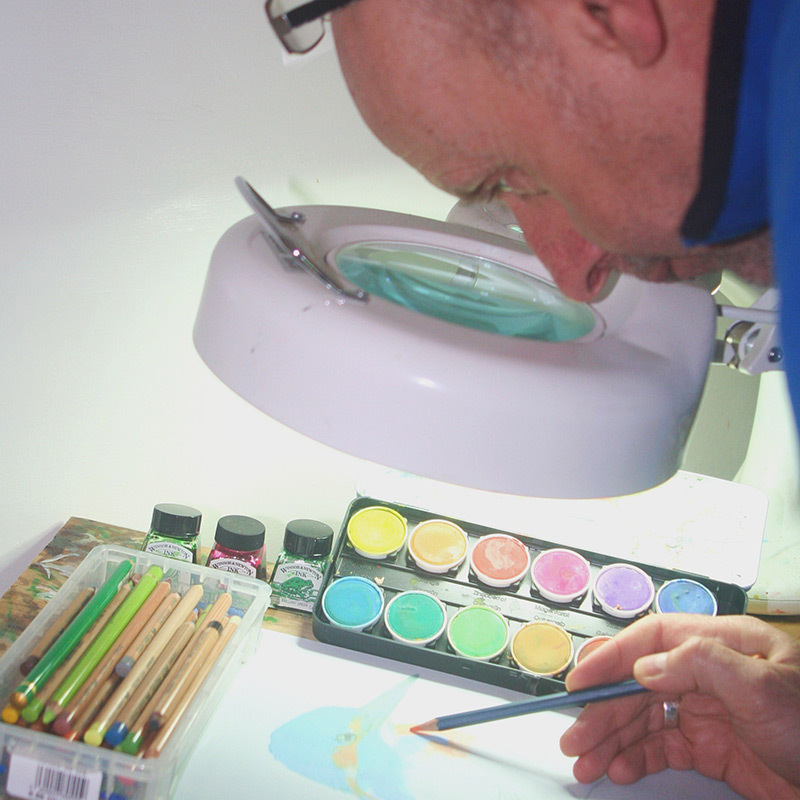 I start with the backgroud colour – apply water onto the paper, not too much, just enough to wet but not soak. Brush the water almost up to the charcoal image of the bird but not touching it. Now choose a light green ink and apply to the wet paper. Rub well in using a No. 6 brush or one of your own choosing. If needed apply more water and if you wish dab in at random, specks of white or orange ink which will break up the green background and add light tones. You can always play around with tonal changes yourself. Allow the paper to dry at room temperature, I find that if you speed up the drying time the paper will warp and twist a little but the choice is yours. Let’s say the bird is a Sparrow – not too many colours will be needed, shades of brown and greys etc. Using the water colour pencils, start to add colour to the image, no need at this stage for any great detail. Pencil in the required colours for the bird and in the appropriate place of course. When you have all the colours needed on your image, wet a No. 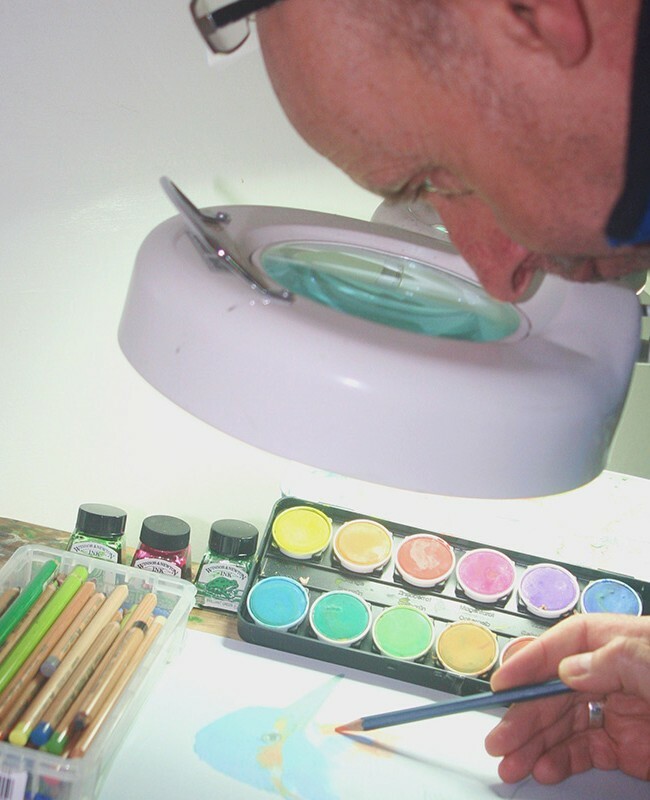 5 brush, or one of your choice and start to blend the colours into the shades required. Take the colours up to and over the charcoal image line and run the colour up to the background, which in this case is the green which you applied earlier, do not go over but up to the green. The beauty of using a soft to medium charcoal pencil is that the water mixture will desolve the initial sketch we did at the start, which leaves no visible lines. Allow to dry at room temperature once again, you could speed things up but I prefer to dry this way, thus ensuring no warping of the paper. Now apply ink of the appropriate colour needed to add a little vibrancy to parts of the watercolour image of the bird, not to the background. For example, shadows and shading but not to completely cover the image, leaving some of the watercolour visible, it is your choice. If you wish to add a little water to this final ink application, you can, it is again your own choice, I personally use the ink straight from the bottle, using a 0 or No. 1 brush because I prefer vibrant colours as you can see in my finished artwork. Let us return to the Sparrow – we are almost at the end. Make sure it is all nice and dry then mount your image onto mounting board with spray adhesive and leave to dry. It is now time to add the final detail with the watercolour pencils always keeping them nice and sharp and use as you would colour pencils, USING NO WATER AT ALL draw in the fine detail of the plumage to make it look alive. You can place your bird on any background or on any object you wish, the decision is yours. This style of painting can be applied to Lanscapes, portraits, and any other artwork you desire, so do have a GO you have nothing to lose, enjoy the process and let me know how it goes.